Imagine you’ve been hiking all day and your legs and feet are throbbing to the point where they need to be elevated and rested. However, sitting down on a tree trunk or amidst the forest floor simply isn’t going to be comfortable enough. This is where a hammock would come in handy, especially one designed as well as the Newdora Camping Hammock. This unique device not only gives you a comfortable place to rest when you’re hiking on a trail, but it can also transform your backyard into a comfortable oasis where you can enjoy a book and the sound of nature. 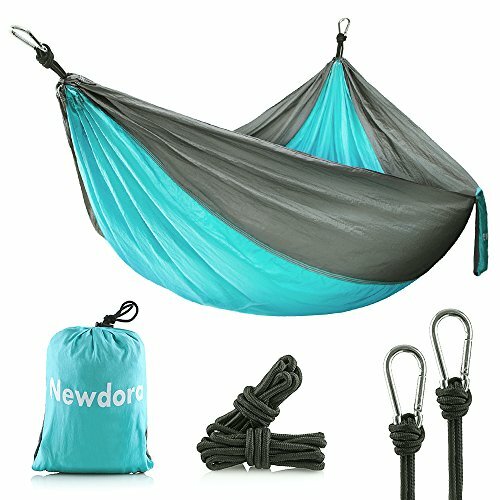 With several different advantages, many unique features, and a few concerns to take into consideration, the Newdora Camping Hammock could easily become your most used item in your hiking gear. Quality construction: One of the first things you’ll notice about the Newdora Camping Hammock is how soft and silky the material is. It’s constructed out of high-quality nylon parachute material, similar to the majority of high-quality hammocks on the market. Highly portable: If you’re looking for an easy-to-carry hammock that can easily be packed up and won’t add weight to your existing hiking items, this entire product weighs only 17 ounces, making it quite easy to bring along on outdoor excursions. High weight limit: Similar to other high-end hammocks on the market, the Newdora Camping Hammock can easily hold up to 600 pounds, as long as it is installed properly. Included carrying pouch: The carrying pouch not only gives you an easy place to store the hammock when it’s not in use, but it can also be used as a beach bag, or a place to store your belongings while you’re asleep at night or taking a nap in your backyard. Multipurpose: You’ll never run out of new and exciting uses for the hammock as it’s not only a necessity for hiking enthusiasts, but it can also be a great addition to your backyard. Not only is it something that adults will enjoy since your kids will love having their own place to relax outdoors or to hang out with their friends after school. Designed for one or two adults: Depending on height and weight, this hammock can comfortably fit two adults side-by-side, but it’s the perfect size for multiple children as well. Depending on the amount of extra material you’d like to have, it can also be a phenomenal option for single users. All-year-round use: Due to the high-quality nylon parachute material used during construction, you can guarantee that the Newdora Camping Hammock is easy to use during every season of the year. However, when it starts to get cooler, you might want to consider adding a sleeping bag or a thick blanket for added warmth. Hanging accessories: Instead of having to buy all of the basic hanging materials needed for a hammock, they are included with your purchase. You’ll be able to take advantage of a rope and steel carabiners to assist with the hanging process. With that being said, it can be beneficial to buy a couple of extra pieces of hanging gear such as tree straps (to protect the trees) and reinforced carabiners (for added weight protection). Set-up: Even individuals who have never had the opportunity to use a hammock before will find that the Newdora Camping Hammock is relatively easy to set up. It also comes with instructions to help guide you through the whole process so you can make sure the hammock is safe and secure. The performance of the Newdora Camping Hammock is surely put to the test once you compare it to another model on the market, such as the Winner Outfitters Double Camping Hammock. Although both models offer the same amount of comfort, there are a couple of differences to take note of before deciding between the two. Double hammock design: The Winner Outfitters Double Camping Hammock is larger than the Newdora Camping Hammock, which makes it easier to hold more than one person at a time. Though the larger the hammock is, the larger it will be when packed away, and it also means that it will be heavier. Depending on your needs, you might want to choose a larger hammock for more than one person or a smaller one that’s more lightweight. Weight restrictions: The Newdora Camping Hammock can hold 100 pounds more than the Winner Outfitters model, which is ideal for larger hikers or campers that need a comfortable place to relax. Attached carrying case: One of the most convenient features of the Winner Outfitters Double Camping Hammock is that the carrying case is attached directly to the hammock, whereas the Newdora Camping Hammock’s bag is separate. An attached bag makes it easier to store your belongings in a convenient place, and it also helps make sure that the carrying case doesn’t get lost while you’re out on the trails. As a hammock that is designed for every member of your family and has multiple uses throughout the entire year, the Newdora Camping Hammock seems to be a great purchase. No matter if you’re a hiking enthusiast or if you’re heading out on the trails for the first time, setting the unit up will be simpler than with other hammocks, especially with the help of the included instructions. The high-quality parachute fibers and phenomenal stitching give you the durability you would expect from a hammock that you intend on using several times throughout the year, if not more often than that. Also, as it’s a full year-round hammock, you won’t have to worry about deterioration as a result of being exposed to the elements. For a comfortable place to rest at the end of a long day, the Newdora Camping Hammock is a great option to have in your backyard or amongst your hiking gear. How to Set Up a Hammock: A Five-Minute Tutorial Best Hiking Hammock: Our Top Picks for Outdoor Comfort Snugpak Chrysalis 3 Sleeping Bag Review What’s the Best Way to Pack a Tent for Backpacking? What’s In A Camping Sleep System?